SEATTLE -- A massive habitat restoration effort by the U.S. government doesn't do nearly enough to improve Northwest salmon runs, a federal judge ruled Wednesday, handing a major victory to conservationists, anglers and others who hope to someday see four dams on the Snake River breached to make way for the fish. In a long-running lawsuit, U.S. District Judge Michael Simon in Portland rejected the federal government's latest plan for offsetting the damage that dams in the Columbia River Basin pose to salmon, saying it violates the Endangered Species Act and the National Environmental Policy Act. It was the fifth time since 2001 that the court has invalidated the government's plans, and rulings in the case show increasing impatience with federal agencies, including NOAA Fisheries, the Army Corps of Engineers and the Bureau of Reclamation. In his 149-page opinion, Simon found that for the past 20 years, the agencies have focused on trying to revive the basin's 13 endangered and threatened salmon and steelhead runs by restoring habitat without compromising the generation of electricity. Meanwhile, he said, federal agencies have "done their utmost" to avoid even considering breaching the Snake River dams -- despite strong suggestions to do so by Judge James Redden, who oversaw the case from 2001 to 2011. Among those who sued the government are the Nez Perce Tribe and the state of Oregon; conservation groups, including the Sierra Club, National Wildlife Federation, American Rivers and Columbia Riverkeeper; and fishing organizations, including the Pacific Coast Federation of Fishermen's Associations. The judge ordered the government to come up with a new plan by March 2018, but he said the invalid 2014 plan could nevertheless remain in effect until then because it does provide some level of protection for the salmon. He said he would not dictate what options the government must consider in the new plan, but he noted that a proper analysis under federal law "may well require consideration of the reasonable alternative of breaching, bypassing or removing one or more of the four Lower Snake River Dams." 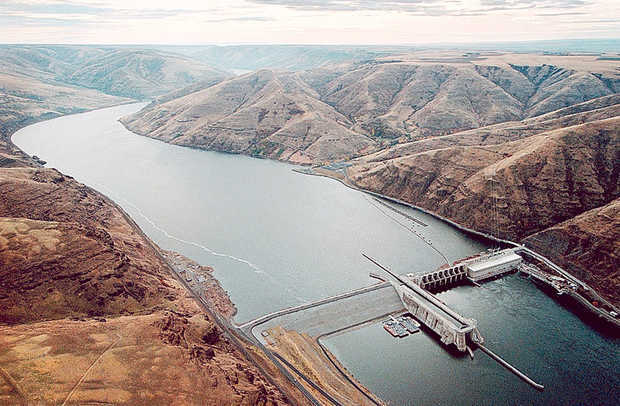 Last summer, hundreds of thousands of adult salmon died because of warm temperatures in the reservoirs behind the Columbia and Snake River dams, said Todd True, a lawyer with the environmental law firm Earthjustice who represents some of the plaintiffs. "We need to seriously consider a plan that retires and removes the four lower Snake River dams," he said in a written statement. "Only action on this scale has the potential to allow wild salmon to survive and recover in light of the vivid threat they face from a warming climate." Oregon officials have suggested another approach: spilling more water over the dams to improve salmon survival rates. The federal agencies were disappointed in the ruling, NOAA spokesman Michael Milstein said in an emailed statement. "The decision will require time and effort to analyze and fully understand," the statement said. "We sincerely appreciate the region's unprecedented collaboration and commitment on behalf of salmon, and the important progress that it has produced. We'll continue our efforts with our partners to protect salmon and steelhead in the basin and work toward their recovery." The Bonneville Power Administration, which operates the dams and has touted the habitat restoration efforts, declined to comment Wednesday except to say it was reviewing the decision. Northwest RiverPartners, an alliance of farmers, utilities, ports and businesses, intervened in the lawsuit on the side of the government. In a written statement, spokesman Terry Flores said the government's plan was "the most science-based, comprehensive and expensive effort to restore an endangered species in the nation." "The decision potentially unwinds years of collaboration between federal agencies, Northwest states and tribes, and other stakeholders," Flores said. "The ruling does not provide a path forward for the region, other than redoing the plan's analysis and conducting an evaluation of alternatives, including dam removal, under the National Environmental Policy Act." In addition to suggesting the agencies consider breaching the dams, the judge found several aspects of the government's plan inadequate. It failed to properly consider the potentially catastrophic impact of climate change on the fish and was based on a dubious legal framework that allowed the agencies to conclude the species were "trending toward recovery" even with very little actual improvement in salmon numbers, he said.